Daniel Hayes, Rosa Town and Emilios Lemoniatis have developed and piloted six new decision aids for improving shared decision making in children and young people’s mental health. This case study looks at the development, implementation and evaluation of this tool, and what they learned. A recent rapid internal audit of the Children and Young People Improving Access to Psychological Therapies Service Transformation Programme  revealed that most young people and parents do not feel involved in decisions about their care and treatment. Decision aids, which are tools designed to facilitate shared decision making (SDM) between practitioners and clients, have been shown to be effective in improving SDM. Dartmouth’s Option Grids™ are one type of decision aid that has been shown to increase shared decision making in other healthcare settings. As part of a Health Foundation Innovating for Improvement grant, the Tavistock and Portman NHS Foundation Trust in collaboration with Anna Freud National Centre for Children and Families adapted Option Grids™ so that treatment decisions fitted within the THRIVE whole-system, needs-led framework (Wolpert et al., 2016). We named this new tool “i-THRIVE Grids” as they have been developed for and within THRIVE-like settings. We successfully developed six i-THRIVE grids for low mood, difficulties sitting still and concentrating, and self-harm. In line with the THRIVE conceptual framework, these were split between getting help ‘within’ or ‘outside’ of’ the NHS. Expert Reference Groups (ERGs) were set up for each presenting difficulty. Grid content was supplemented with research evidence, or expert/stakeholder consensus when research was sparse. Piloting of the grids took place in two CAMHS teams within the Tavistock and Portman NHS Foundation Trust. Baseline data collected from both teams indicated these clinics already had high levels of SDM at the start of the project. 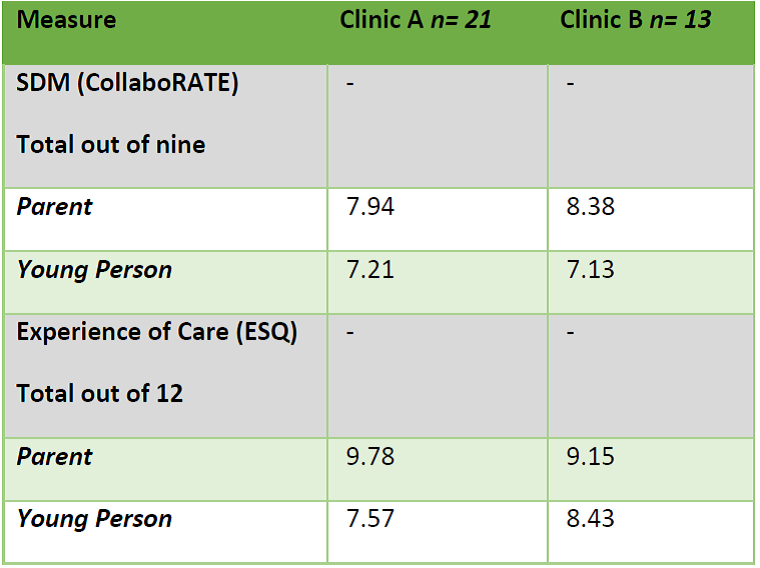 However, there was still some room to improve, particularly as young people gave lower scores than parents on the SDM measure, CollaboRATE , across both clinics. The two CAMHS teams (Clinic A and Clinic B) took part in the refinement, piloting, and evaluation of the grids. Of 41 young people and families seen at Clinic A and 26 young people and families at seen Clinic B, nine people used the grids in Clinic A and one person used a grid in Clinic B. We sought continuous iterative feedback from young people and parents throughout the course of this project. One source of feedback was our ERG meetings with of young people with experience of depression, ADHD and/or self-harm. Young people stated that they liked the colours, layout and design of the grids, particularly after we employed a graphic designer to improve the grids. Some clarity over wording was suggested by young people, which led to our decision to lower the reading age on the grids. 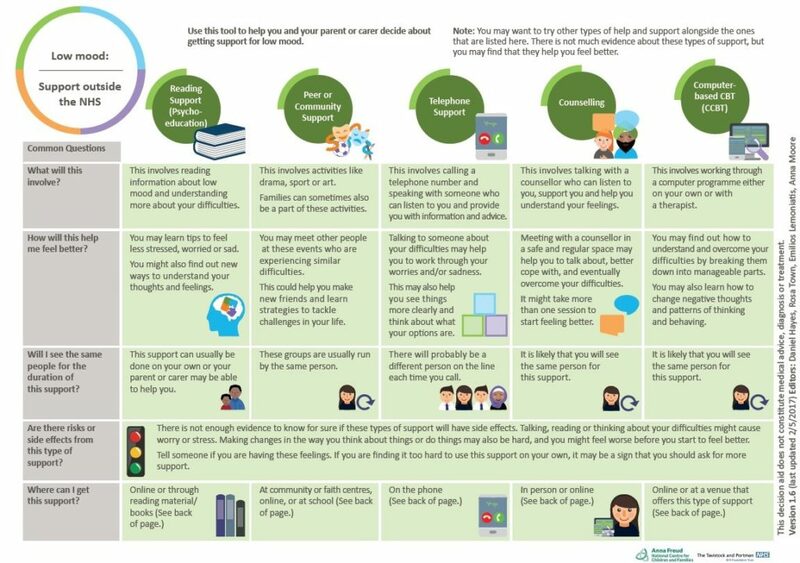 We were particularly struck by several young people’s comments that they wished they had had something like the grids when they first sought help for their difficulties. In August 2017, after five months of implementation, we compared baseline and follow-up data on grid usage across several measures. We found that parents who had used i-THRIVE grids in an assessments session reported significantly better experience of care on the CHI-ESQ than parents who had not used the grids. However, no significant difference between baseline and follow-up was found regarding parent or young person SDM on CollaboRATE, young person experience of care on the CHI-ESQ, or modality of intervention received. Ceiling effects of baseline measures and screening out of cases that could have used the grids (e.g. potential ADHD cases sent to specialist clinics) prior to assessment could account for this. Interviews were collected from six clinicians and one parent who had used the grids in practice and one clinician who had not used the grids. Findings have been separated between 1) impact of grids and 2) implementation of grids. Interviewees described the grids as useful, reliable information sources that accurately covered the range of available treatments. Clinicians described how the grids helped to remind them about things they may forget about outside of the NHS. 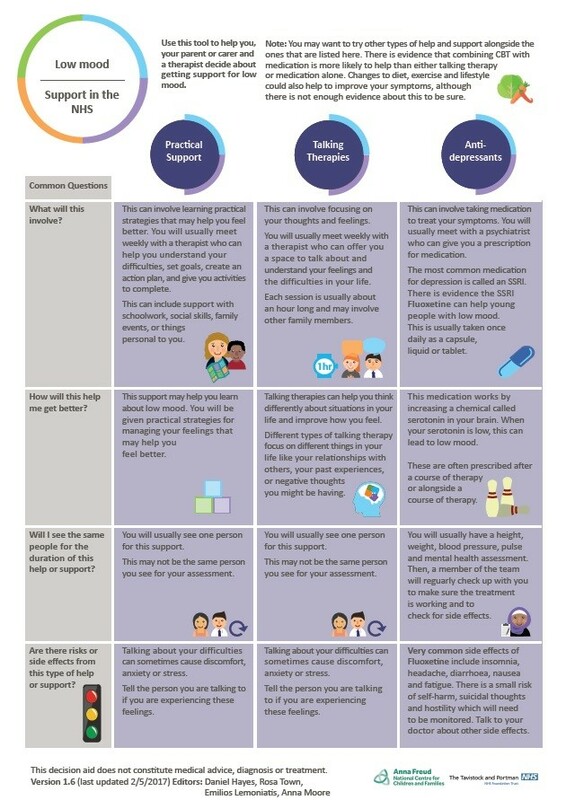 Clinicians described how the grids also served a purpose outside of the clinical encounter, as they could remind service users of the treatments available to them after their appointment. The parent we interviewed echoed this sentiment and explained that having access to the grids was empowering. Within the session, participants described how use of the i-THRIVE grids uniquely enhanced and facilitated discussion around the different treatment options that were available. In line with previous research indicating that decision aids can increase service user satisfaction, the parent we interviewed explained how the grids allowed her to make the decision that was right for her family. Clinicians commented on young people and parents’ desire for the grids and how service users saw the grids as intrinsically useful. Most clinicians felt that the i-THRIVE grids were easy to use and that they did not detract from practice. One clinician explained that the grids reduced variability and created uniformity so that service users reliably received the same information. However, some clinicians described how the grids seemed burdensome and “mandatory”, and that this added to their already packed schedule. Other clinicians believed the grids were not burdensome, as they were flexible and could be used whenever a clinician felt they were appropriate. Clinicians found the grids useful in the context of assessment clinics, as this was when options for treatment were often discussed. Clinicians described other situations in which the i-THRIVE grids could also be useful, including schools and A&E. Clinicians requested that the grids be available electronically to make them more accessible. One clinician described how it would have been preferable to have had the choice to participate as a team in the project from the outset, rather than feeling that it was mandated from on high. To adapt the grids to fit into a new needs-based system, it was necessary to move away from a severity-based conceptualisation of treatment and to include other types of care and support available in schools and third sector organisations. Collaboration and coproduction with young people and parents was essential in getting the look and feel of the grids right. Due to a wide array of similar treatment options, which was overwhelming to parents and young people, we found it was more effective to collapse treatments into hierarchical categories on the grids. Consistency, time and considerable effort were necessary to engage staff members in the project, who initially saw the introduction of the grids as burdensome. This was greatly aided by embedding a researcher within the assessment clinic, creating a ‘You said, we did’ poster and having an informal feedback loop between staff and the research team. This allowed for coproduction between staff and researchers. We found it challenging to recruit young people and families to use the grids from the assessment clinics. These clinics had very few ADHD cases, as due to local pathways they were often rerouted to another specialist clinic at intake. There were also fewer total incoming assessment cases than we had anticipated. In future, this could be improved by mapping the service pathway and looking at data regarding the service’s service user presenting difficulties before grid implementation. At the site of the pilot, the i-THRIVE grids will be available electronically, incorporated into the Carenotes system, and will continue to be used in other clinics and appointments. The six grids will be available through the i-THRIVE Community of Practice, currently covering 72 CCGs. The North East London Foundation Trust (NELFT) is at the forefront of this exciting work as they will have the opportunity to trial and evaluate i-THRIVE grids within their services from autumn 2017. Rosa Town (i-THRIVE Grids Research Assistant) at rosa.town@annafreud.org, or Emilios Lemoniatis (i-THRIVE Grids Clinical Lead) at elemoniatis@tavi-port.nhs.uk. G. Elwyn, PJ. Barr, SW, Grande. R. Thompson, T. Walsh, EM, Ozanne (2013) Developing CollaboRATE: A fast and frugal patient-reported measure of shared decision making in clinical encounters. Patient Education and Counseling 93(1), 102-107.